Good evening! I apologize for not writing anything recently- I certainly had a busy week, and unfortunately this fell by the wayside. Never fear though; I'm back writing with an unusual topic for today. In fact, this topic is so interesting that I think I will break it up into two portions. Today we are talking about the biological impacts of radiation caused by the meltdown of the Fukushima nuclear power plant. The next post will discuss the more human aspects of the disaster. I don't aim to be a political blogger, but I think that to fully understand issues, we need to understand a Full World Paradigm - humans are key players in their environment, like it or not. Fukushima. This is a name that has been rolling off the tongues of newscasters around the world for months. 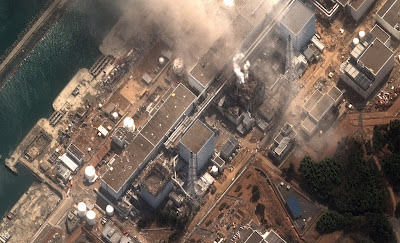 Most of us know it as the nuclear power plant in Japan that was subject of a massive meltdown following the events of March 11, 2011. What most of us may not realize is that the effects of this event are still very much ongoing for citizens of Japan, and widespread economic impacts are even reaching the U.S.
Aerial view of Fukushima before the disaster. Nuclear power produced by Fukushima was an economic driver and point of pride for the local community. In the most significant nuclear disaster since Chernobyl, Fukushima Daiichi's issues began when the plant was flooded by the tsunami and emergency generators failed to work. Nuclear power is generated by an exothermic reaction of unstable radioactive elements- usually uranium - and as a result the heat generated is used to create steam, and then energy. However, because such large amounts of heat are generated by these fission reactions, a continuous supply of water must be pumped through to keep the container from overheating, or melting down. When the March 11, 2011 tsunami occurred, three of the six reactors at Fukushima experienced total meltdown over a matter of time. As a result, the area was evacuated for a 20 mile radius as the government attempted to recoup and solve the situation. Aerial photo as the first of 3 total reactors melt down. 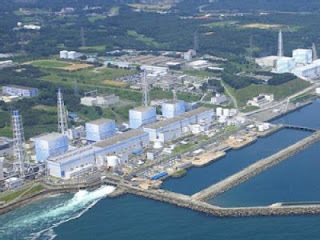 The meltdown of the 3 reactors caused what is speculated to be large amount of radioactive fallout into the environment. Radioactive isotopes take years to 'decay' fully- that is, break down into non-radioactive elements- and are very pervasive. They have the ability to interact with living tissue, causing radiation poisoning in extreme cases, or cancer later. Even more worrisome, these radioactive elements can work their way up the food chain, therefore affecting entire ecosystems and if in significant concentrations, render human food supplies dangerous. Science Corner: What is radioactivity? In case some of you are still confused on visualizing what radioactive elements are, I'd like to break that down further very quickly. As we all know, all matter is composed of elements- pure chemical substances that have a nucleus containing a set number of protons and neutrons, surrounded by small electrons. Most elements have the same number of protons and neutrons. As an additional note, uncharged or 'neutral' elements have the same number of electrons as protons. There are two different types of radioactive matter: radioactive elements, or radioactive isotopes. Radioactive elements, such as uranium, have such a naturally high number of protons and neutrons that they are unstable by nature. In fact, it has the second-highest number of protons of any naturally-occurring Earth element. Uranium occurs in 6 different isotopes, each with between 141 and 146 neutrons. Over time, uranium sheds 2 protons and 2 neutrons at a time, called an alpha particle. As these are progressively shed, uranium breaks down to less-radioactive, and eventually stable elements. Radioactive isotopes are a different story altogether, and can in fact entail a wide range of elements. Once an atom takes on a number of neutrons that is significantly greater than the number of protons it has, it becomes unstable and thus radioactive. The radioactive particle then sheds those extra neutrons over some period of time and then becomes stable again. In fact, these reactions are happening all of the time, but so quickly and so infrequently that they don't affect us. 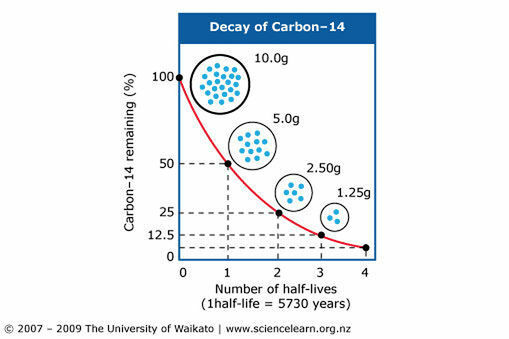 Because they decay at a stable rate, radioactive isotopes can be used for dating organic materials, as in Carbon-14 dating. Lastly, there are such things as stable isotopes. These are elements, such as carbon-14 that only have a slightly greater number of neutrons than protons. They also have half-lives but no negative effects like radioactive elements do. An example of this would be Carbon-12 or Carbon-13. Most (99.9999% etc) isotopes around us are stable. Radioactivity isn't visually or physically apparent, making it especially dangerous. The only sure way to detect radiation is with a Geiger counter. For this reason, governments usually shut off areas within a certain radius of the disaster site- Japan currently has an area of 12 miles shut down around Fukushima. For a map of the evacuation and affected areas visit this New York Times article. In January, the Japanese government finally cleared the area as stable, and cleanup of the nuclear fallout was initiated. It is unclear whether this will work or not- generally when there is a nuclear disaster, the area is shut down indefinitely. 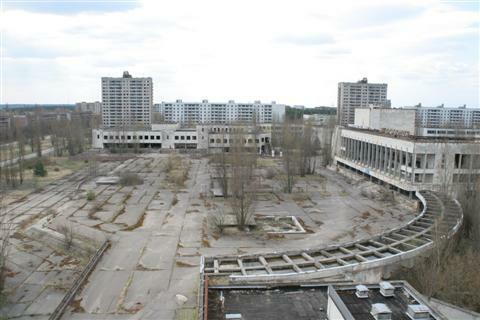 The most notorious nuclear ghost town is Pripyat, originally a town of about 50,000 near Chernobyl, Ukraine. The town was deserted after the disaster, and is still radioactive after 25 years. 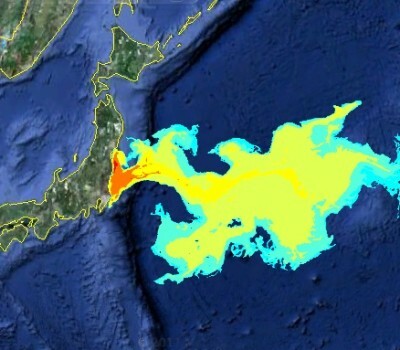 While the land around Fukushima is currently abandoned except those working to recover it, an overall unknown amount of radioactive material entered the ocean near Fukushima. Estimates of possible impacts have been widely ranging, depending on who you ask, but the main worry is that wastewater from the facility, as well as material contaminated with radioactive isotopes will remain in the oceanic system for years to come. Fortunately, due to wave action, much of the radioactivity has been dissipated (there is such thing as 'safe' amounts of radioactivity- albeit naturally-occurring levels are 1,000's of times less than measured around Fukushima). However, material that works its way into the sediment on the seafloor could remain in the system much longer as it will be out of the way of wave action. Some animals have already shown signs of radioactivity- namely tuna, which have made their way over to the coasts of California. The news networks of course quickly picked up and expounded on the 'radioactive tuna' off our shores. However, the levels of radioactivity in these fish is honestly too low to be of concern. In fact, it's possible that methyl-mercury levels- a long known biocontaminant known to be in tuna- are more dangerous than the radioactivity. Here is a nice article summarizing: Daily Beast- Radioactive Tuna. Left long enough in the ecosystem, however, undissipated radiation could have unforeseen effects. We can only really guess at what will happen in the future- fortunately by the time most material reaches North America, much of the radioactivity will be dissipated. It will be important to keep an eye out for contrasting results, however, as debris continues to make its way onshore. Ongoing studies will help us understand the full extent of the damage that this event caused and will cause- only time will tell. Until then, we will just have to wait with bated breath and hope for the best. See you next time for Part II.